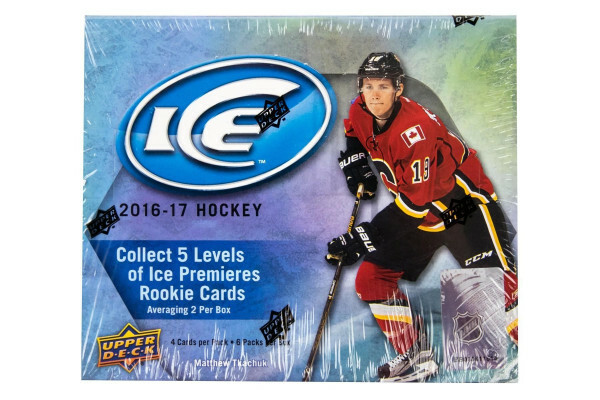 Produktinformationen "2016/17 Upper Deck Ice Hockey Hobby Box NHL"
Ice Premieres Rookie Cards Numbered as Low as 99! Look For Ice Premieres Rookie Autographs Numbered as low as 25 and Ice Premieres Rookie Autograph Patches Numbered as Low as 10. The Second Installment of Exquisite Collection Hockey Cards Are Here. Featuring an Array of Stunning Cards, Including Autographs of this year's top Rookies! NEW! Look For The New Magnificent Sub Zero Insert. Featuring Top Talent in The NHL on a Holographic Acetate Surface Making This Set Within a Set a Force to be Reckoned With. Look for 4 Awesome Memorabilia Inserts All Including Red Parallels. Featuring Frozen Foursomes With 4 Swatches from 4 Different NHL Stars. Back by Popular Demand, Ice Champions Makes its Return With a Cool Die-Cut Design Falling 1 in Every 80 Packs! Find Autographs From Your Favorite Active Players and Retired Legends in Rinkside Signings and Glacial Graphs. 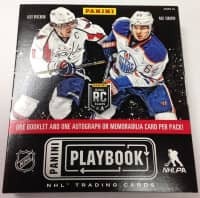 Weiterführende Links zu "2016/17 Upper Deck Ice Hockey Hobby Box NHL"
Fanbewertungen für "2016/17 Upper Deck Ice Hockey Hobby Box NHL"